To install easyReservations you’ve multiple options. You can enter your WordPress websites admin area and head over to Plugins -> Add new, search for easyReservations and click on Install. After activating it in the plugins table you can start. 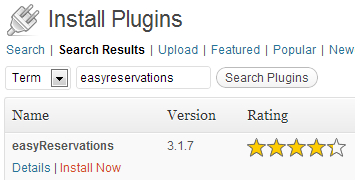 If that fails for any reason you can download the plugin in .zip format from easyreservations.org or wordpress.org. Extract the file to any folder with an extraction program like WinRAR. Then connect to your FTP server and go into the directory /wp-content/plugins in your WordPress installation. Upload the extracted folder easyReservations to the directory and activate the plugin in the plugins section in the admin area. If you want to update easyReservations you can use the normal update function of WordPress which will also notify you about updates. If that fails, you want to downgrade or install a beta version you can use the upload plugin from .zip function in the plugin section or upload it over FTP and just overwrite the old files. To uninstall it just deactivate it on the plugins page and click on uninstall. If you’ve activated the option in the main settings all saved data will get deleted.